Please join us for national educator Diane Henry's class. Bet you're one of those quilters who thinks everyone else can make consistently spaced and perfectly executed quilting designs with no help at all?! That's not real life! That kind of quilting flows from a lot of practice. 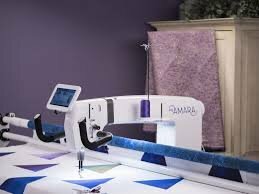 Real life means recognizing and using tools and supports that can help us achieve the kind of quilting we want to see on our quilts while we are still practicing! In this class, you'll learn not only how to use those resources but how to make your own. Date: May 4, 2019, 9:00am to 12:00pm. Cost: $49. Please call the shop to register: 540-786-2289.